Silver Perch (Bidyanus bidyanus) are a hardy native fish which can tolerate most water conditions and variations in water temperature. 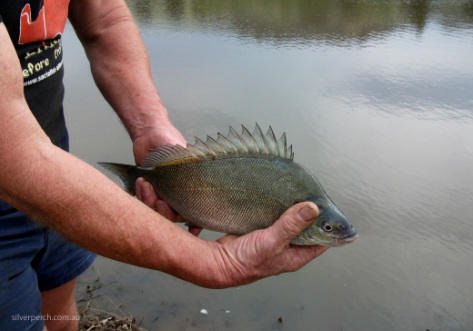 Silver perch are suitable for farm dams and aquaponic systems. Silver perch are omnivores. In dams they feed on small insects and vegetation and help to control algae growth. They are easily fed on commercial fish food and also like lettuce, bread and even peas! Silver Perch naturally forage on small insects and vegetation, and will readily eat fish food pellets. Silvers present very well for the plate, although can retain some ‘weedy’ flavor if they are not purged in fresh water first.